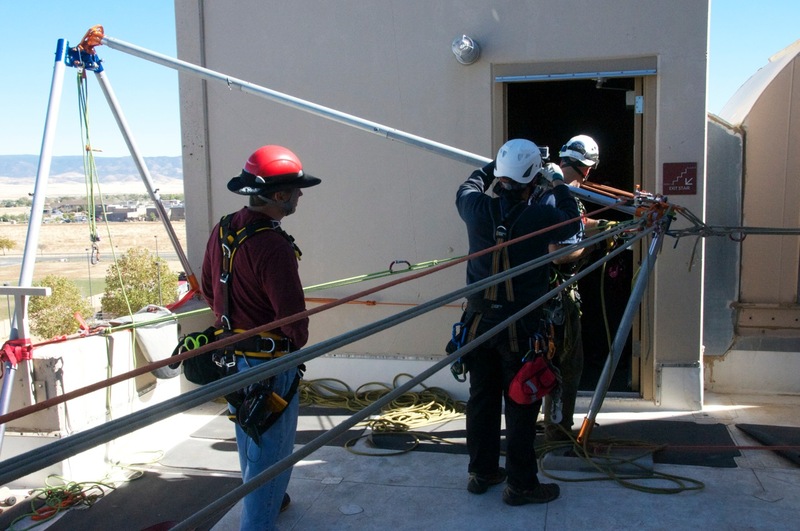 During this 2014 steep angle evacuation using an extra tall Arizona Vortex, a standard kit was used along with extra outer legs to bring it to over 10' in height. 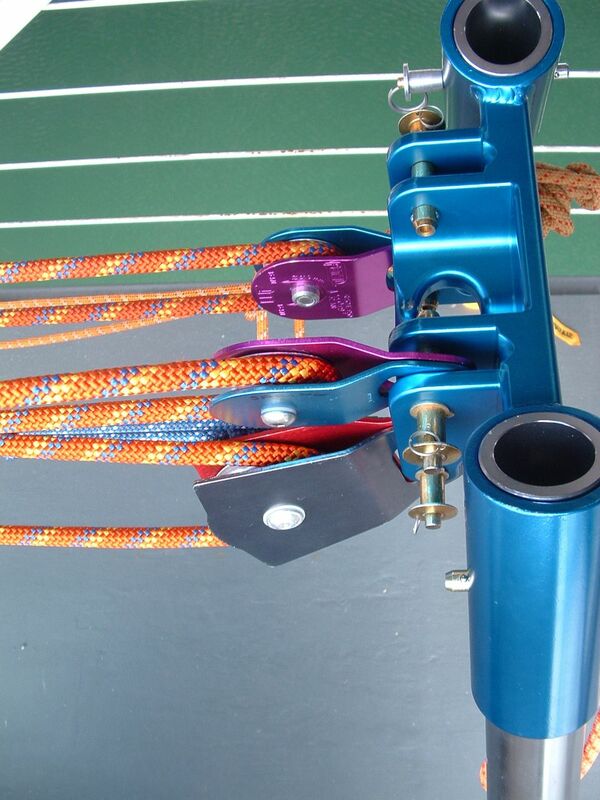 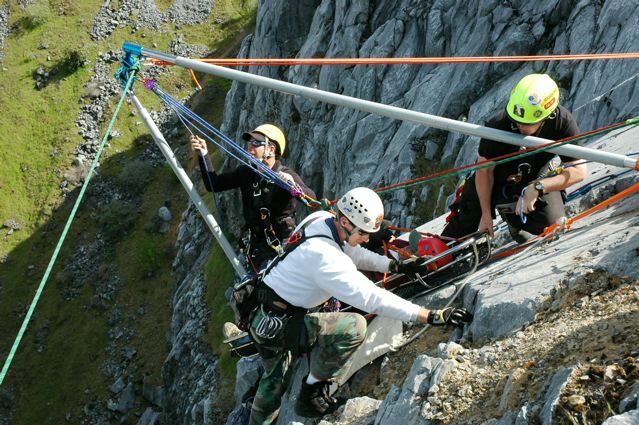 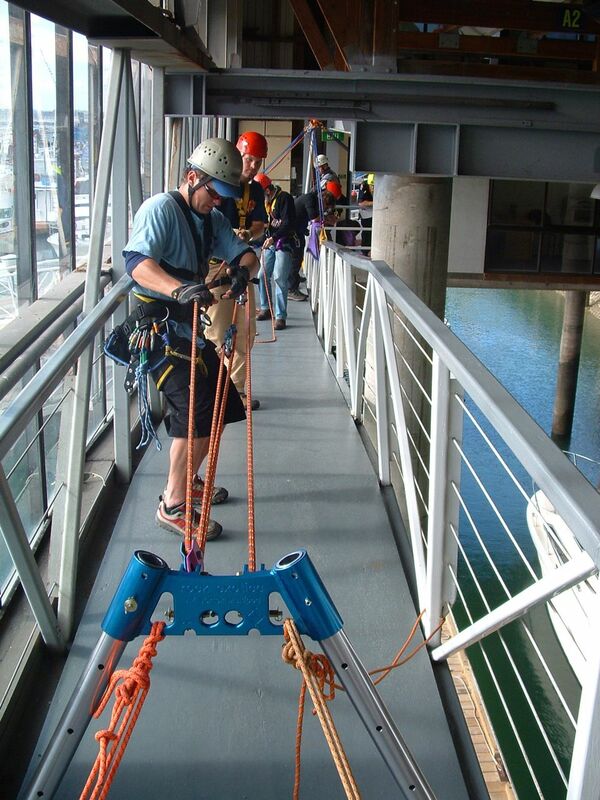 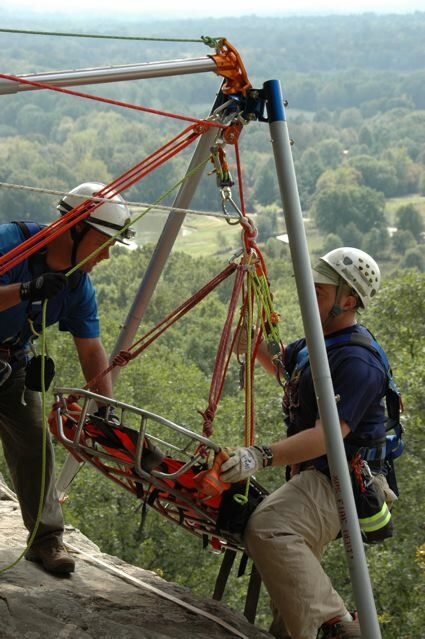 An AZTEK kit is used to elevate the main and belay lines in this two-tendsioned rope system. 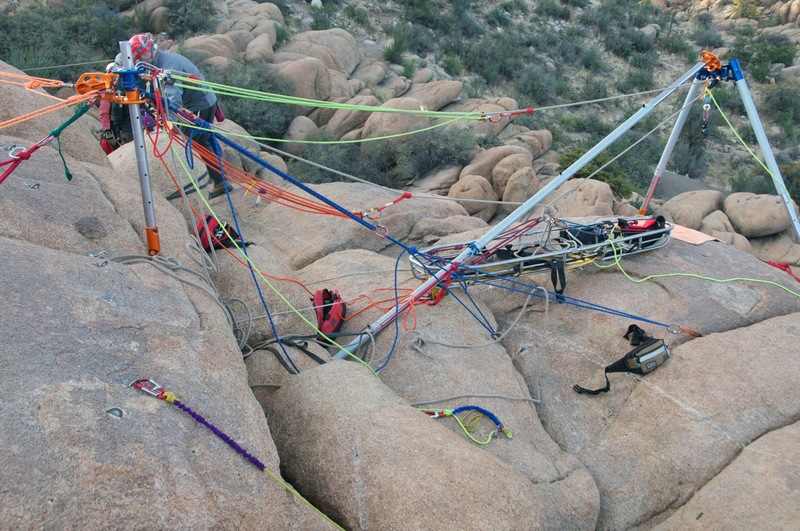 This equal sided tripod was so high that the edgeman had to climb it to set the main AZTEK at the apex! 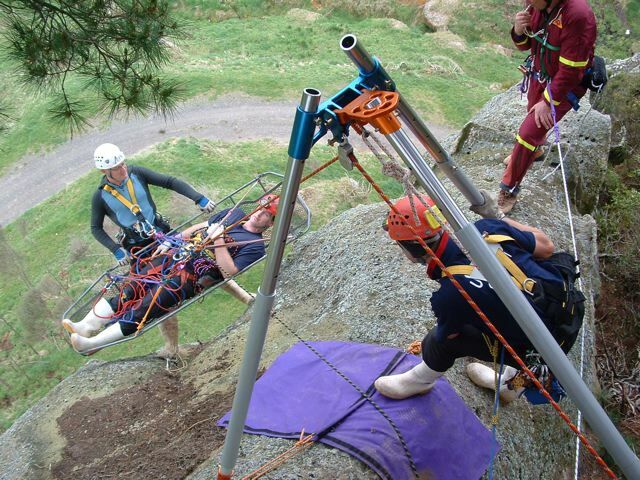 This steep angle high tripod constructed with the AZV used 9 outer legs (2 more than comes in a standard kit) and 3 inner legs. 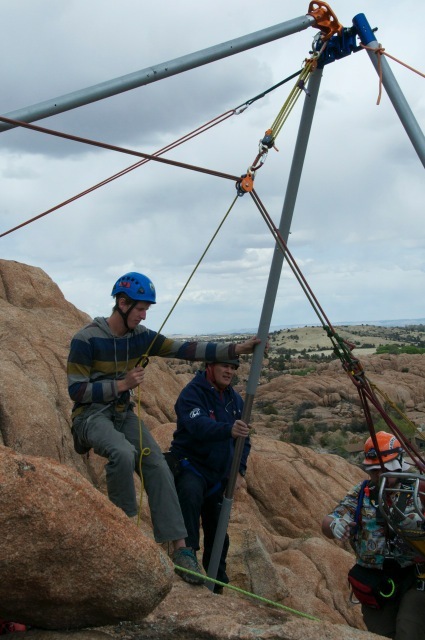 It is over 10' high to accomodate the AZTEK for the main and belay lines. 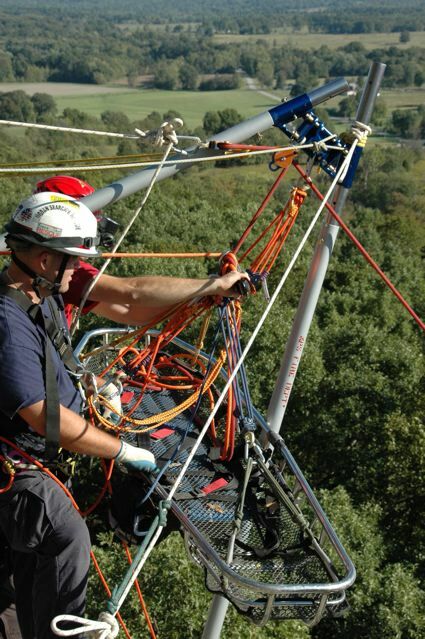 Phil Pedry is the edgeman and is lowering the AZTEK and main lines down as the litter appraoches the top. 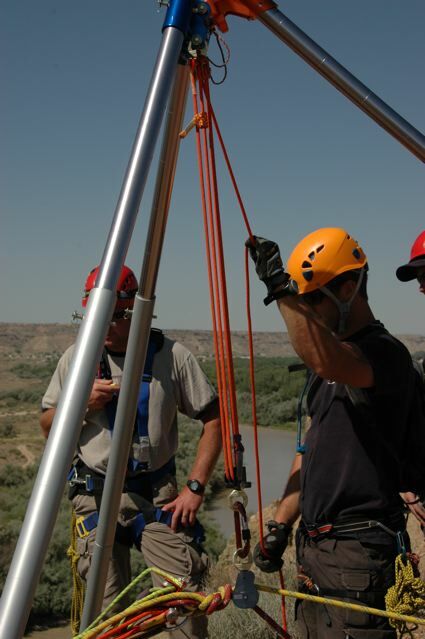 Farmington (New Mexico) Fire Department using the ARIZONA VORTEX in 2008 RTR custom workshop for a steep angle litter evacuation over one of the bluffs adjoining the muddy San Jaun River. 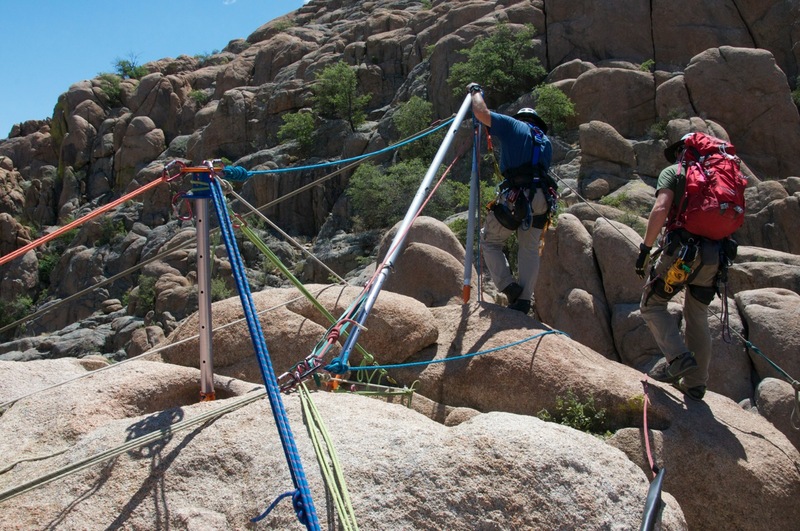 This tripod was 9' high and used all the legs in a standard kit. 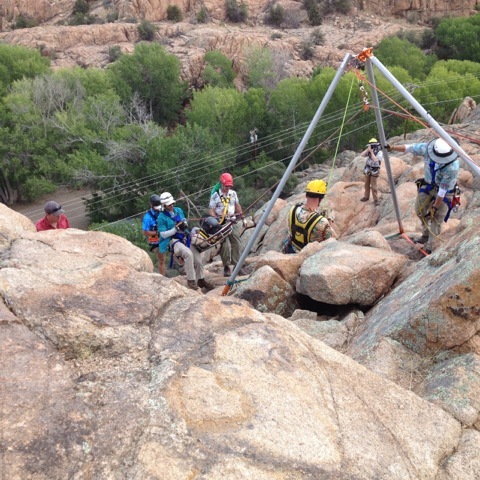 Rescuers at Farmington Fire used pickets to anchor the Raptor Feet down to the top of the bluff above the San Juan River. 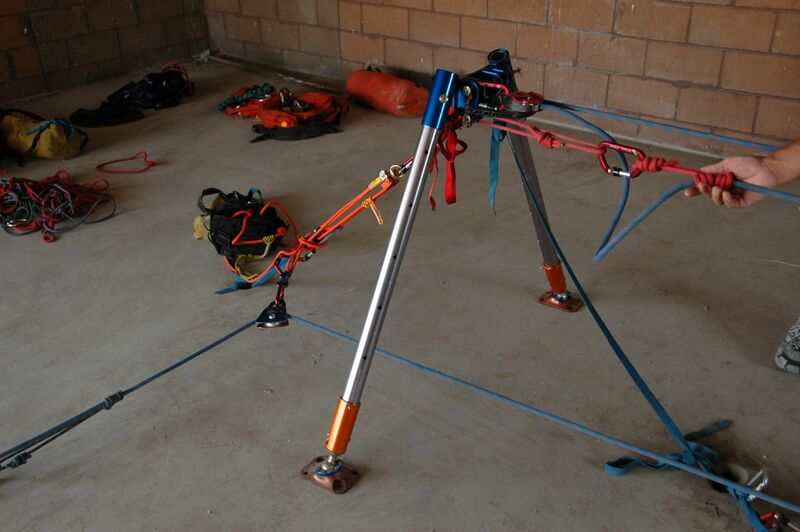 During the Farmington Fire steep angle evacuation, the AZV has each leg equal with 2 lower legs and 1 upper leg (the extent of the tripod with a standard AZV kit that only has 7 outer legs). 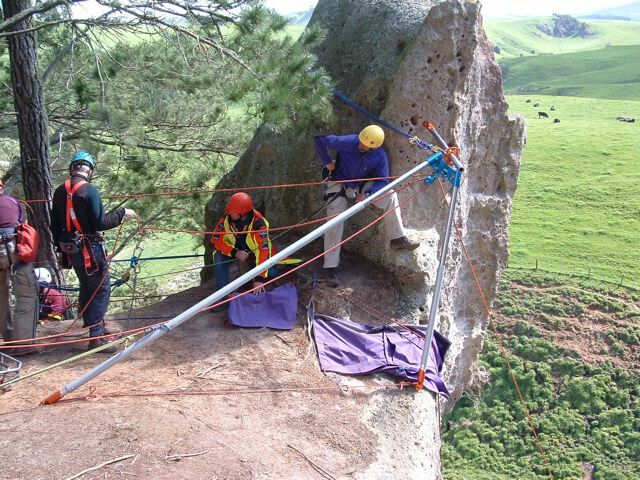 The belay line is separated out on this evacuation style and is left on the round edge of the bluff on padding. 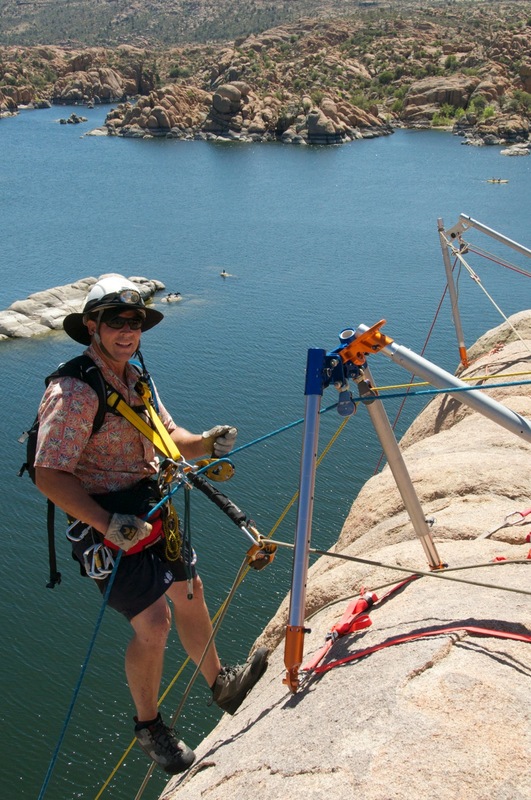 The belay may also be elevated in some circumstances to keep it off the edge of the embankment. 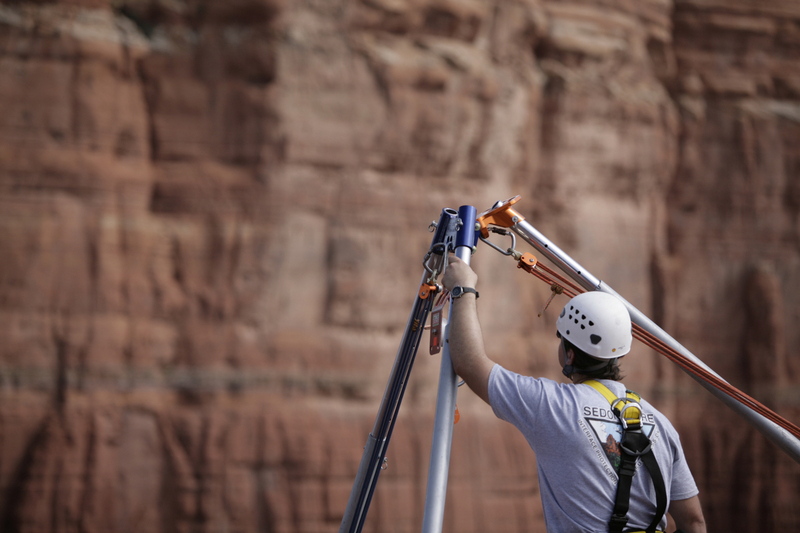 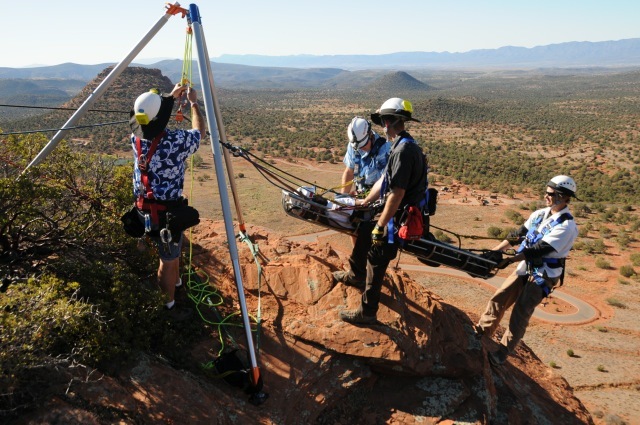 A standard AZV kit using 7 outer legs to build this high tripod for a steep angle evacuation in Sedona. 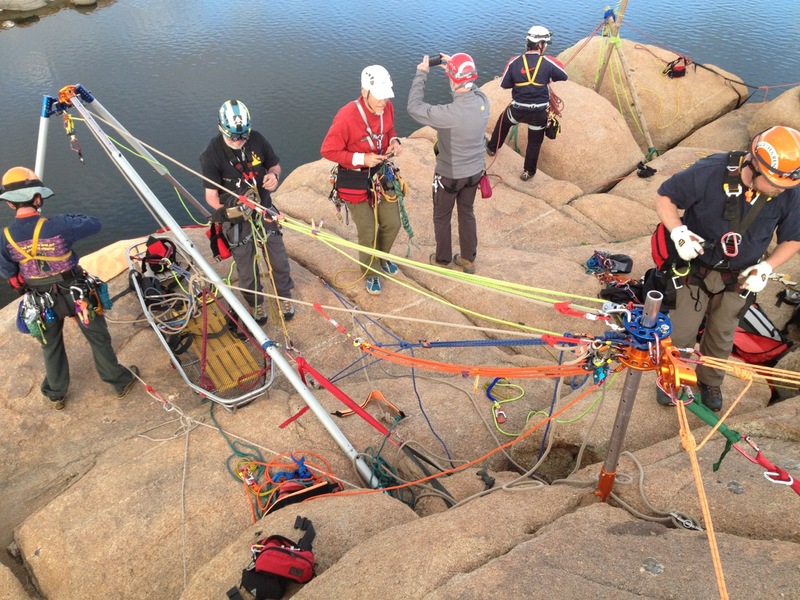 Photo 1: During an RTR all-Japanese advanced rigging program in 2014 at the Granite Dells in Prescott, AZ studetns constructed a first time ever combo Arizona Vortex easel A frame linked to a gin pole using the AZORP head from Rock Exotica. 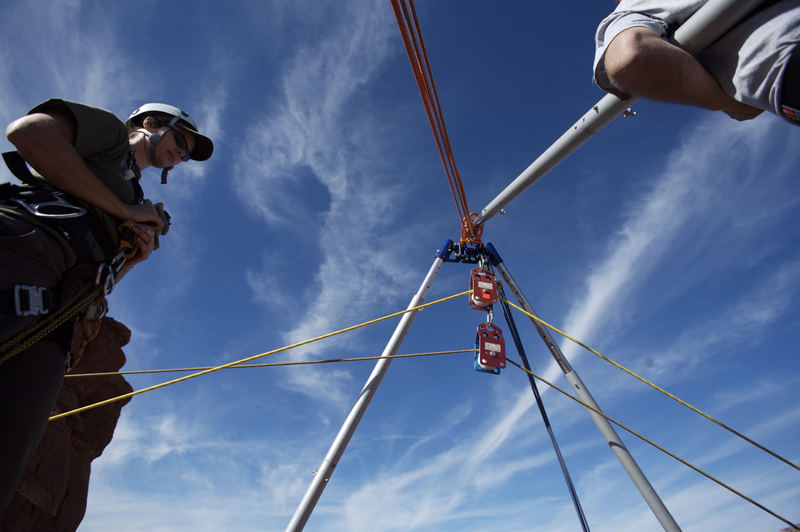 The gin pole stabilized the extra long back easel leg and also provided an anchor point for the evolution. 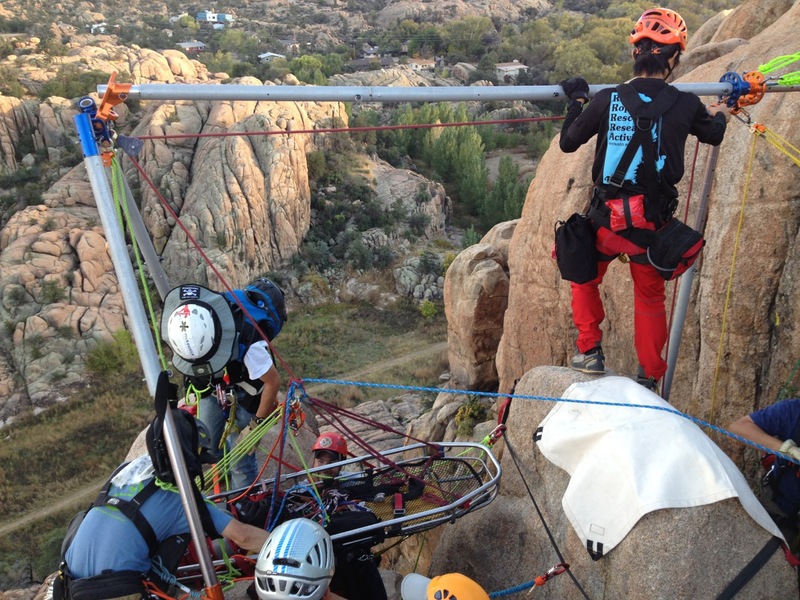 Photo 2: During an RTR all-Japanese advanced rigging program in 2014 at the Granite Dells in Prescott, AZ studetns constructed a first time ever combo Arizona Vortex easel A frame linked to a gin pole using the AZORP head from Rock Exotica. 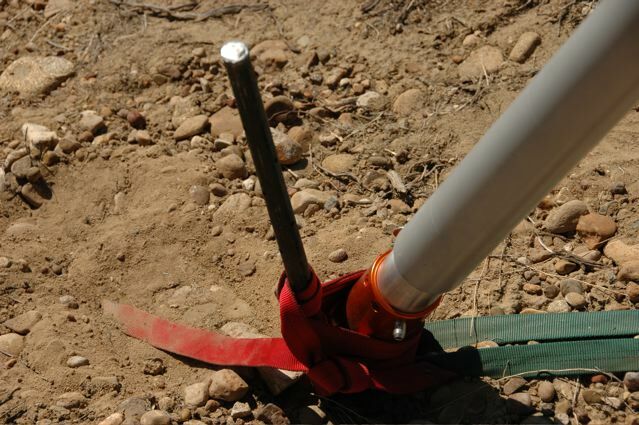 The gin pole stabilized the extra long back easel leg and also provided an anchor point for the evolution. 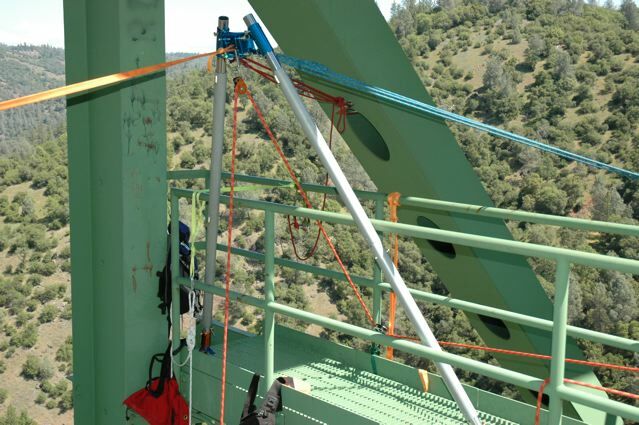 AZVM employed extensively on the Forest Hill Bridge during Team Skills Rescue Workshop in Roseville, California. 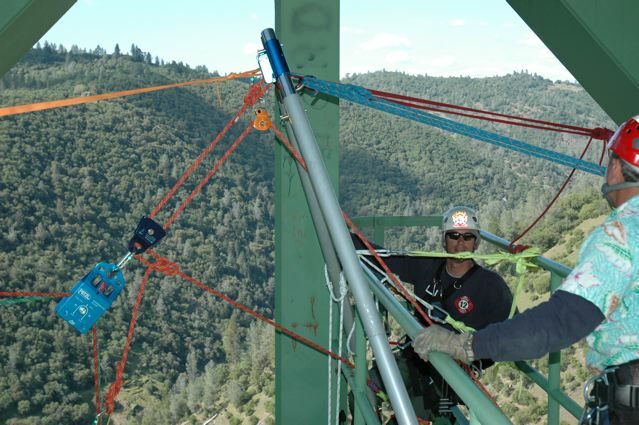 Forest Hill Bridge is California's HIGHEST bridge and also the third highest in the untire USA. 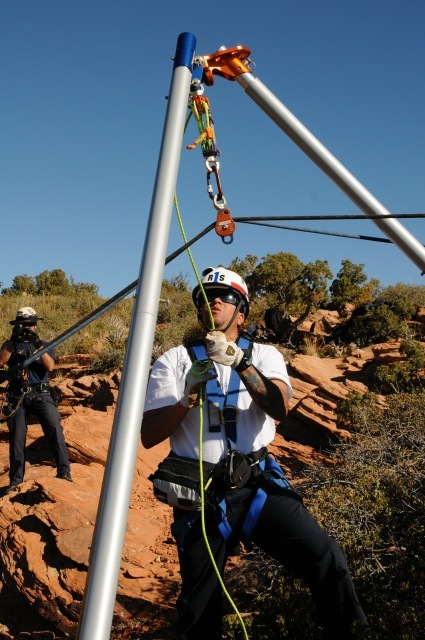 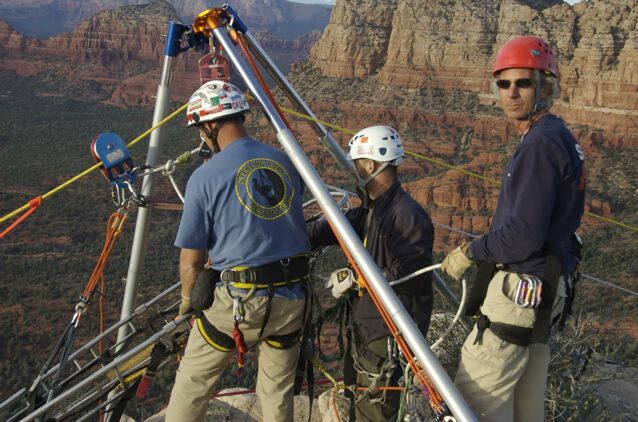 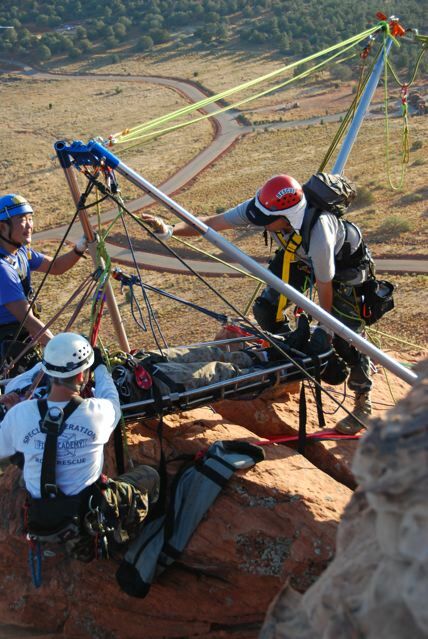 Close uo of the AZVM holding up a highline during the Advanced Skills Rescue Workshop in Sedona, Arizona 2008. 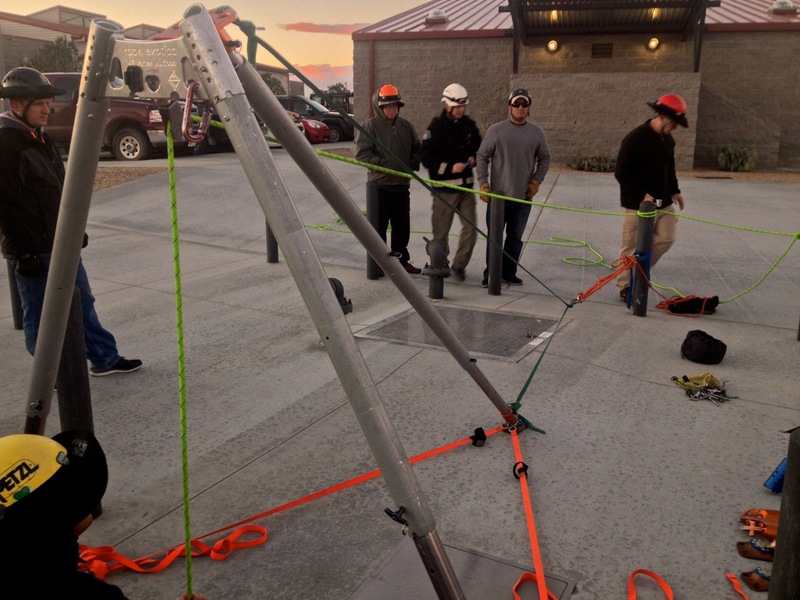 Gin pole constructed from other half of AZVM head assembly. 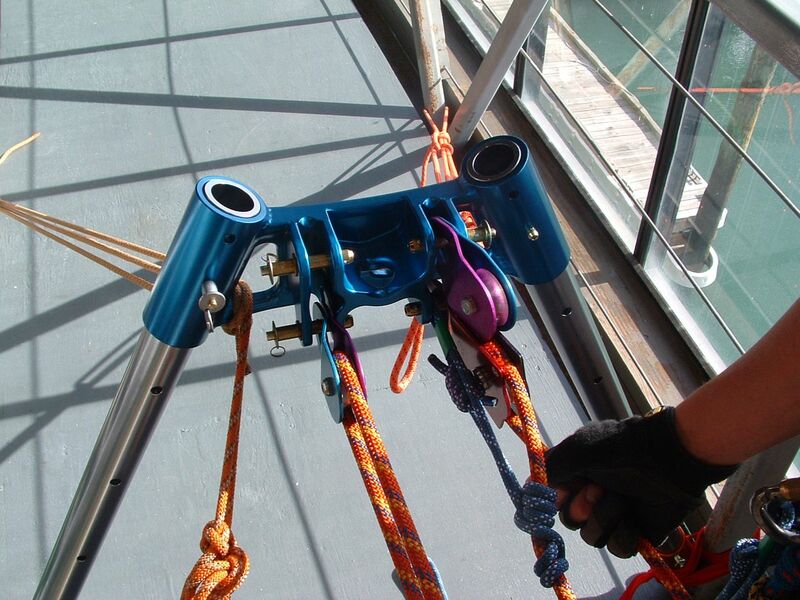 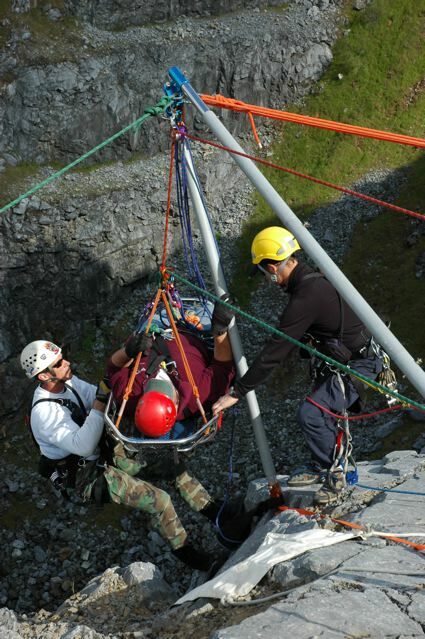 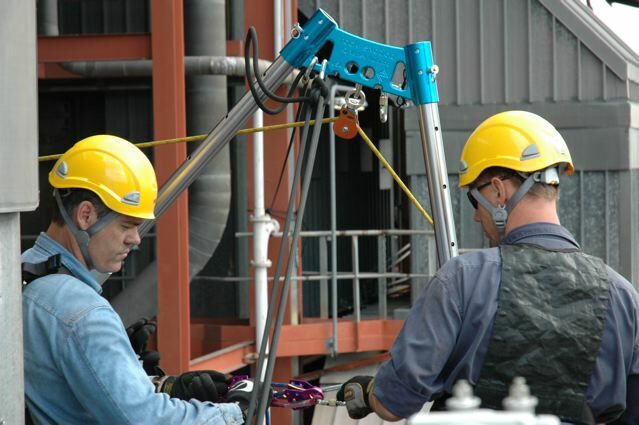 New Zealanders rig a mini A Frame with the AZVM which allows the pulleys of a lifting system to be pinned directly into the blue head assembly as shown. 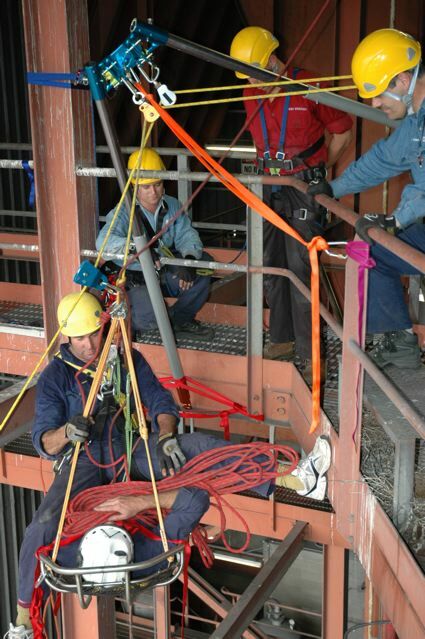 This afforded a high point for the system on this narrow catwalk. 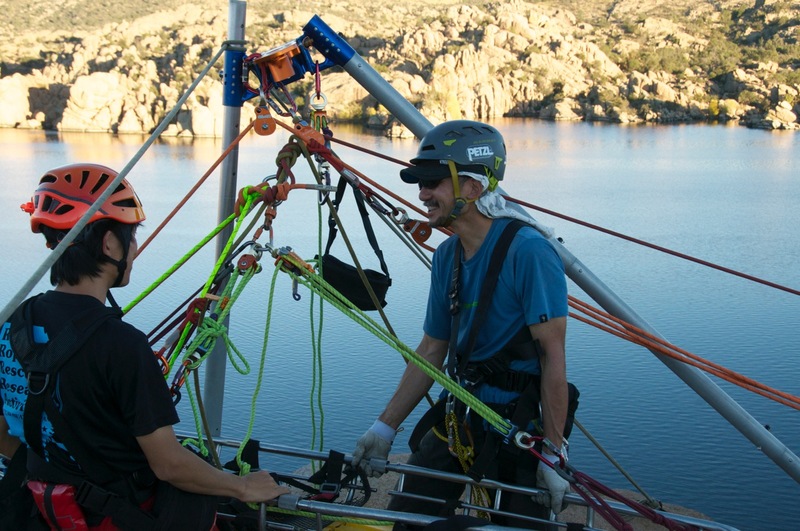 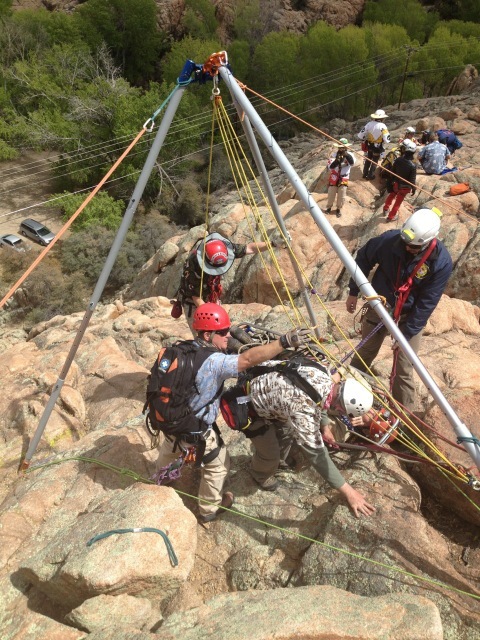 Interesting Guyed SA frame and rigging pod combo at Granite Creek Gorge downstrem of the Watson Lake Dam during the 2014 TSRW (Team Skills Rescue Workshop) with the Arizona Vortex. 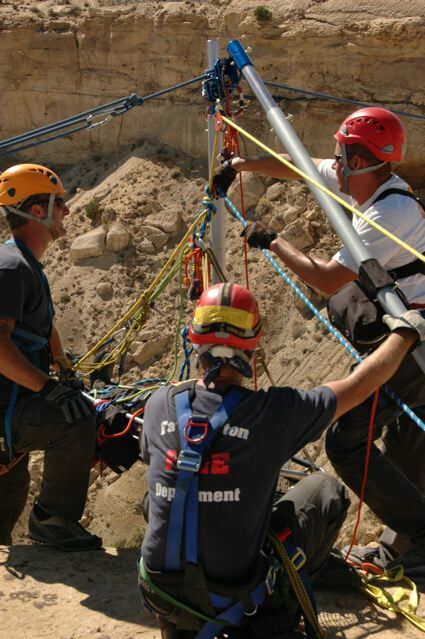 Twin guyed SA Frame employed extensively in the Cool Limesone Quarry during Team Skills Rescue Workshop in Roseville, California. 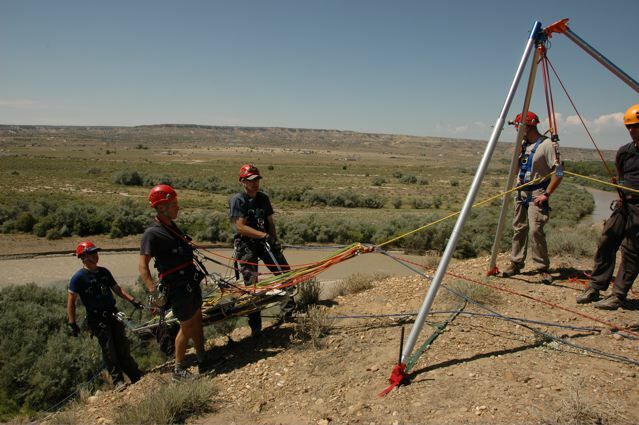 Farmington (New Mexico) Fire Department using a twin guyed SA Frame during 2008 RTR custom workshop for a high angle litter evacuation over a dramatic sandstone ciff edge. 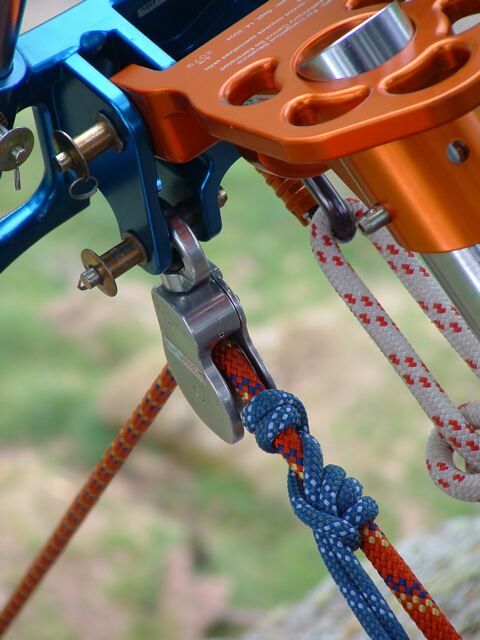 Guy anchors were made from driving #2 baby angle pitons into drilled holes in the soft stone. 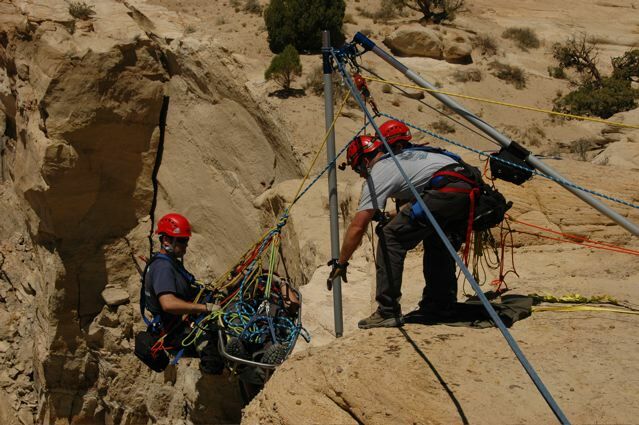 Farmington (New Mexico) Fire Department using a twin guyed S A Frame during 2008 RTR custom workshop for a high angle litter evacuation over a dramatic sandstone ciff edge. 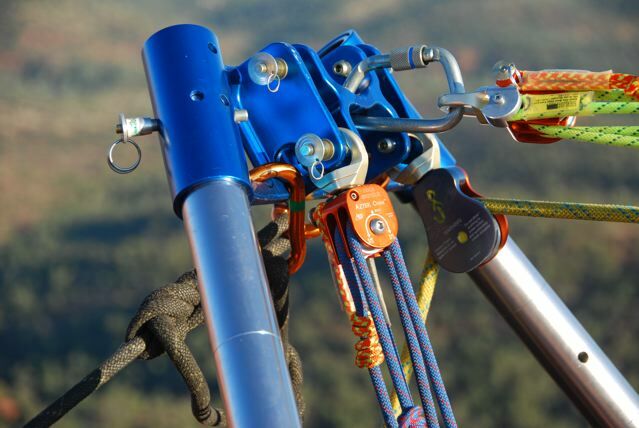 Guy anchors were made from driving #2 baby angle pitons into drilled holes in the soft stone. 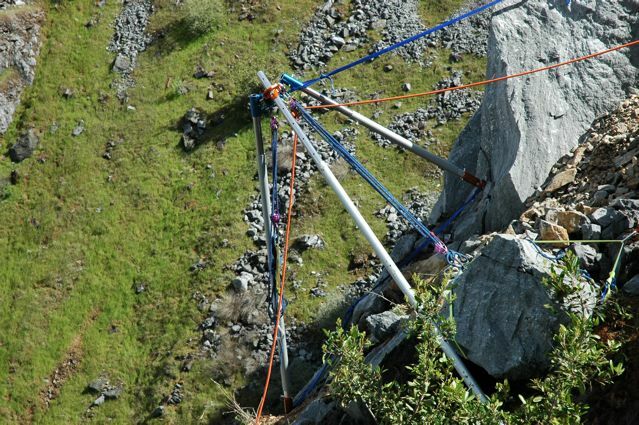 A guyed SA Frame used at Mt. 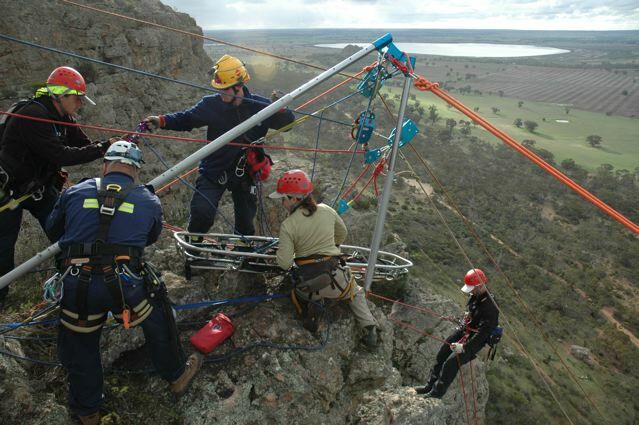 Arapiles, Victoria, Australia during English reeve highline in Advanced Skills Rescue Workshop in 2007. 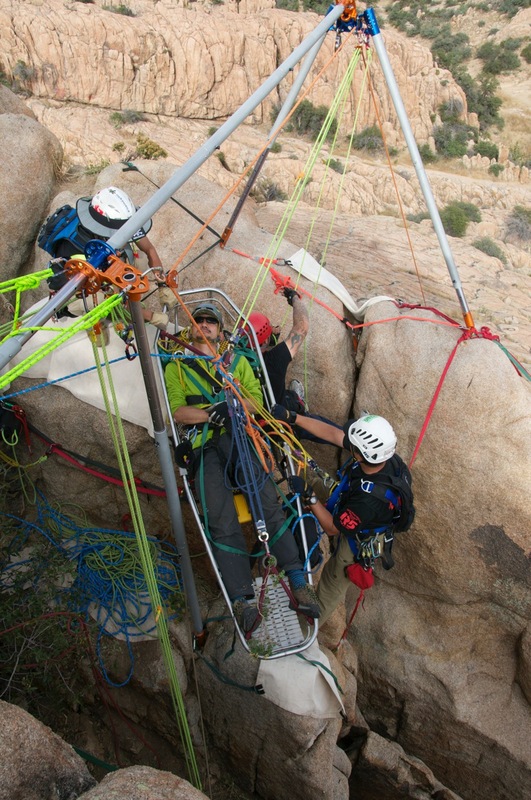 Note, two AZTEKs used to guy the S A Frame to left. 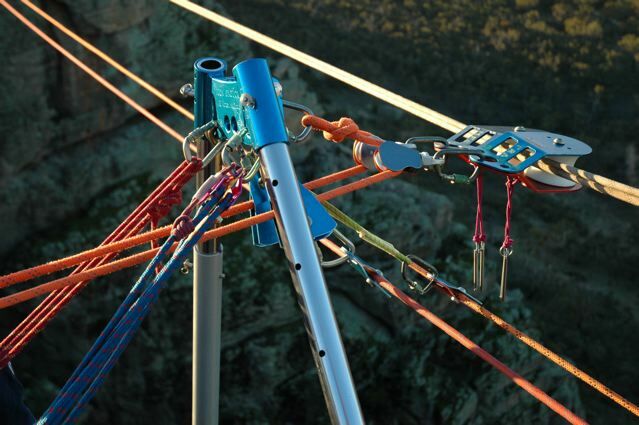 Highline provides tension to the right. 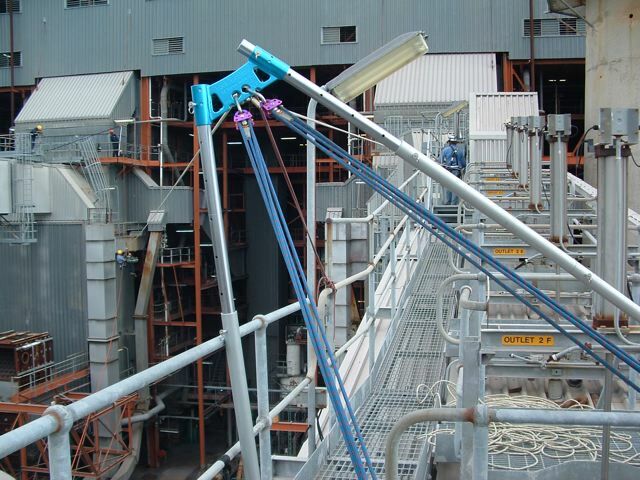 Very unusual setup for an SA frame. 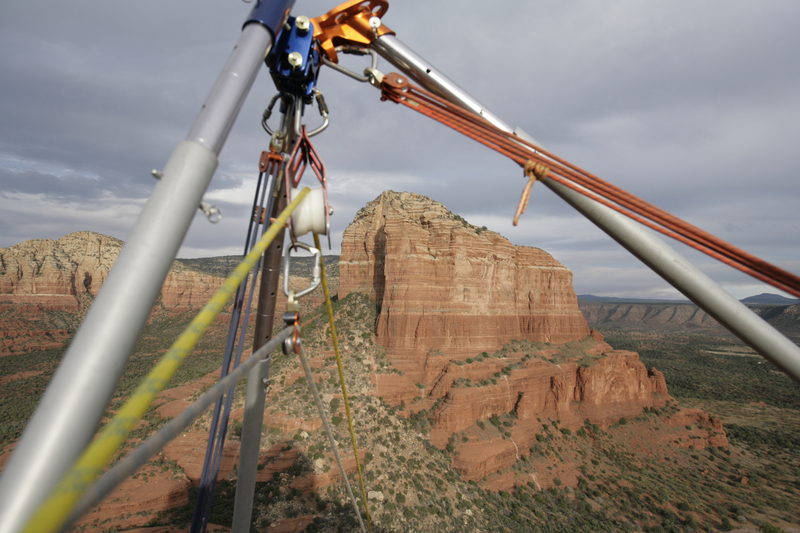 Our extreme 2,115' long Kootenay highline in Sedona between Courthouse Butte and Bell Rock in 2007. 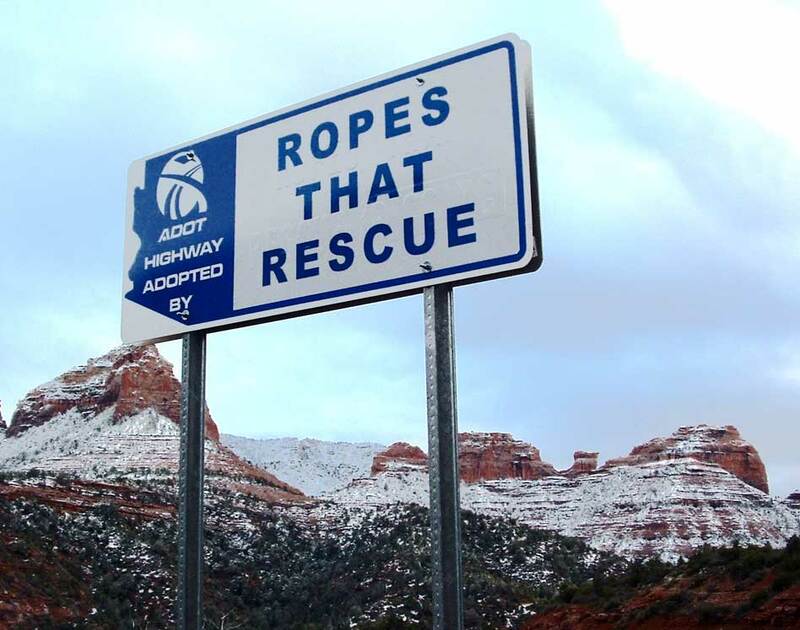 Counrthouse in the far distance. 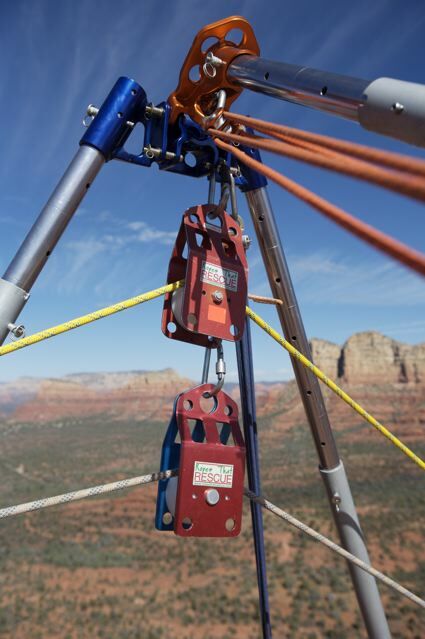 Bell Rock lazy leg SA frame shown in this photo by Sterling Rope photographer John Burcham. 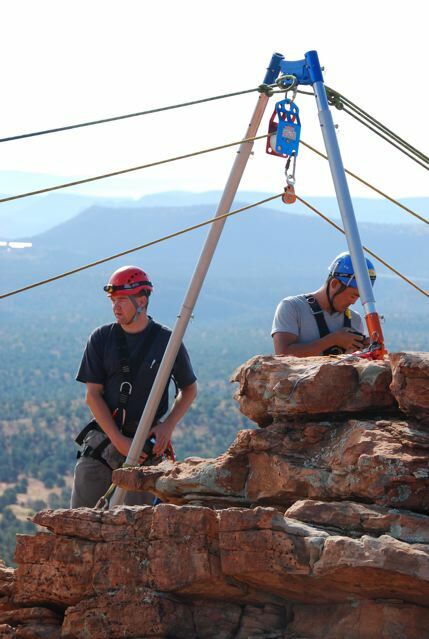 Courthouse Butte in the distance. 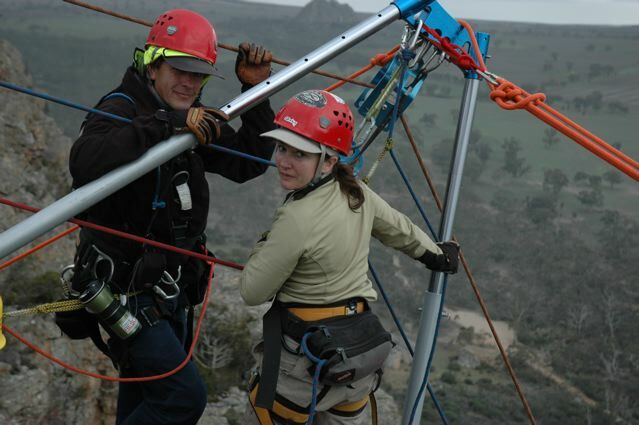 Lazy Leg SA Frame in the foreground. 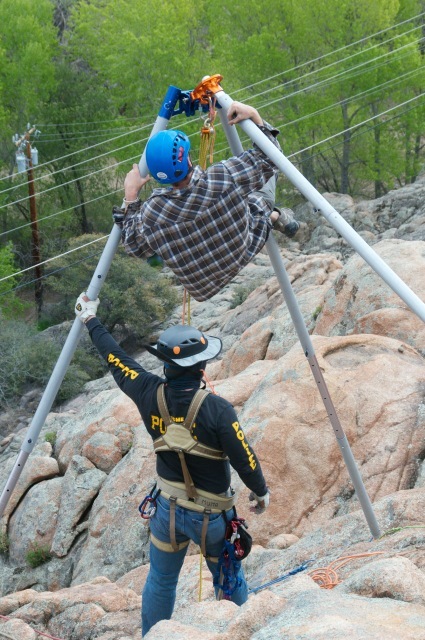 Photo courtesy of John Burcham Photography and Sterling Rope. 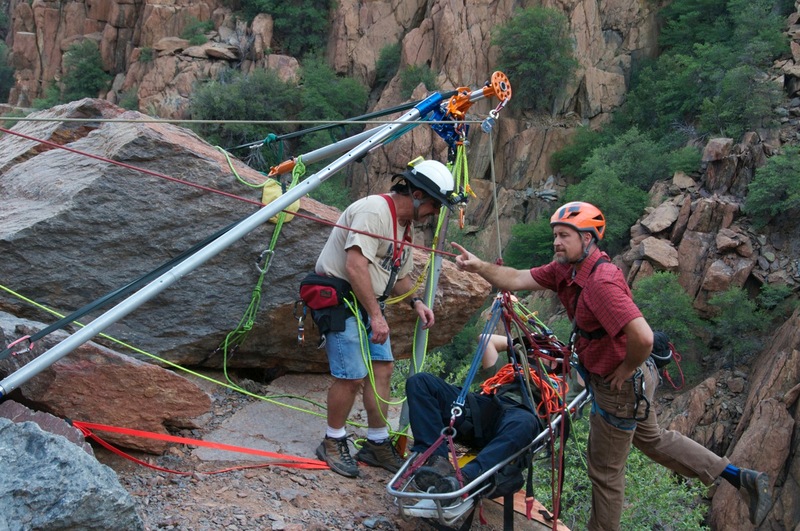 Bell Rock side Lazy Leg SA Frame at Courthouse to Bell Rock Highline 2007 in Sedona Arizona. 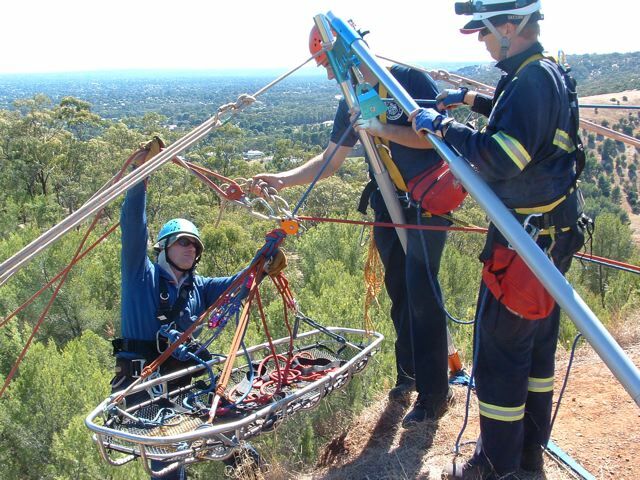 Rob McDowall of Aukland Fire Brigade as edgeman with Lazy Leg SA Frame used at Mt. 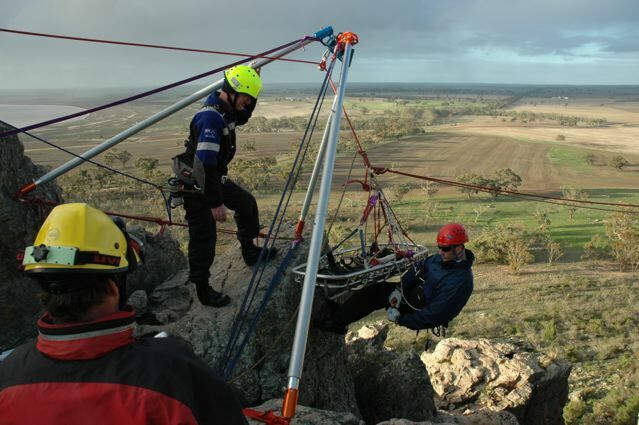 Arapiles, Victoria, AU during two rope offset in Advanced Skills Rescue Workshop in 2007. 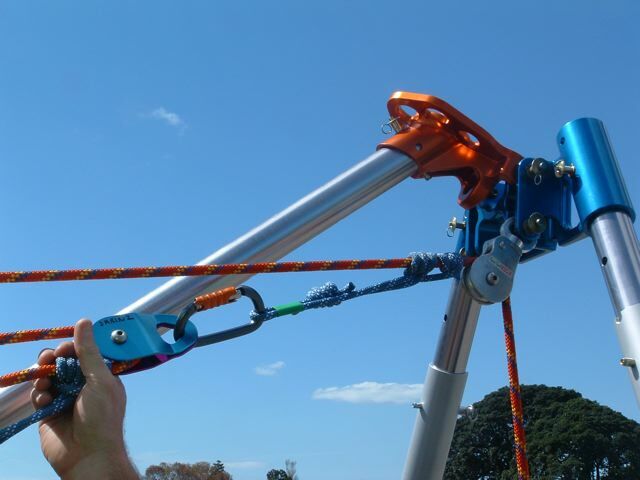 Lazy Leg S A Frame used in Wherepapa, New Zealand for skate block tracking offset operation. 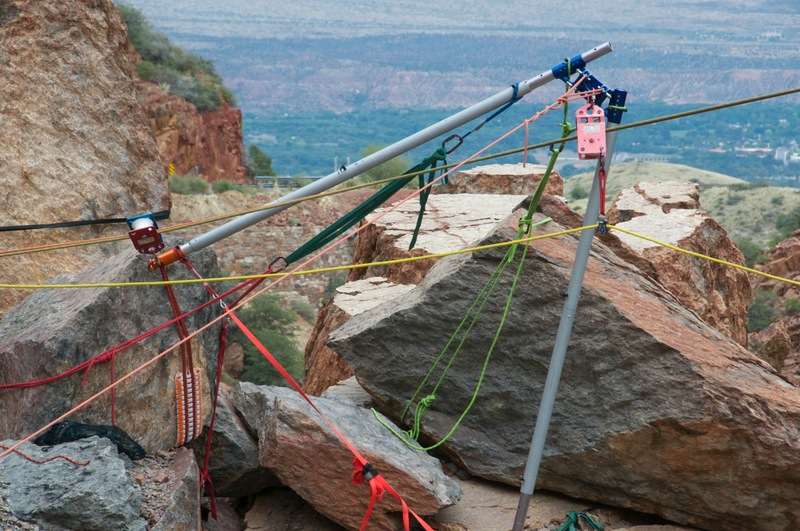 Notice lazy leg held into place on rock by AZTEK set of fours. 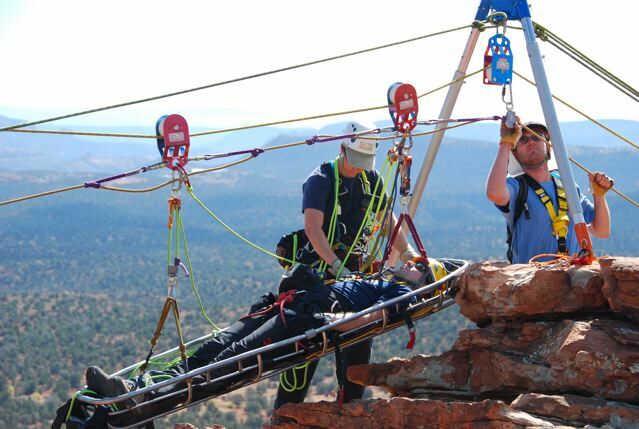 Aussie Steve Bennet attends to a pseudo "Lazy" leg SA frame used at Mt. 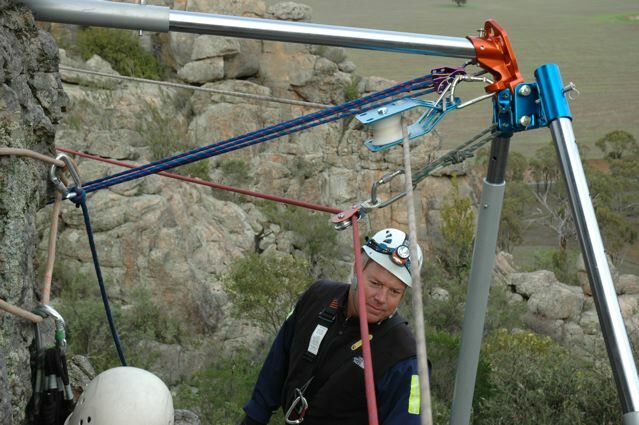 Arapiles, Victoria, Australia during simple transportation highline in the Advanced Skills Rescue Workshop in 2007.